Your benefit donation is tax deductible, except for $20 for each person attending. 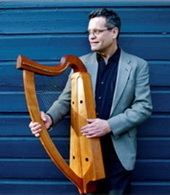 A mid-day break concert of Irish and Scottish Gaelic music by James Ruff, Tenor and Early Gaelic Harp. A Pheadair, a aspail, an bhfaca tú mo ghrá geal? Peter, the apostle, have you seen my bright love? Ceard atá le caoineadh ágainn mura gcaoinimid a chriámha? What have we to keen without his bones? An é sin an maicin a hoileadh in ucht Mháire? Is that my child who I weened in my arms and nourished? James Ruff presents music from his recently released CD: The Gaels' Honour. Pipe marches to stir the soul, noble laments that bring a tear to the eye, love songs to warm the heart, and stormy politics of 17th and 18th century Scotland and Ireland – James Ruff lends his voice to rare early Celtic music of the Gaelic world, sung in Scottish Gaelic and Irish, and accompanying himself on the wire-strung Clàrsach, whose bell-like tones rang through the great halls of the Gaelic clan chieftans. Music of the great harpers: O’Carolan, the Connellans’, Ruaraidh Dall, Denis Hempson, Hugh Higgins, and drawn from the Bunting, Neal, Forde and Straloch manuscripts. All proceeds from the concert will benefit Christ the King Episcopal Church. Copies of the CD will be available for purchase at $15. Prize-winning singer and harper James Ruff will lead you on a journey through the historic music traditions of Gaelic Scotland focusing on the lore of the Gaelic harp and its historic links to the pipes and Gaelic poetry. James will perform and discuss traditional work songs, love songs, pipe songs, harp songs and mouth music – including selections from his new CD: The Gaels’ Honour. James will also be performing for the Classic Scottish Concert at 9pm. James Ruff plays a concert of evocative Irish and Scottish repertoire for the Early Irish Harp, as part of the Scoil na gClairseach - Festival of the Early Irish Harp. Aaron Copland School of Music - Queens College - 65-30 Kissena Blvd. He will also perform on the concert later that evening. Come experience the delights of early Celtic music - lilting language and ringing strings fill an afternoon of music spanning the courtly music of Gaelic Scotland and Ireland. James Ruff, award-winning Gaelic singer and harper, will delight your ears and hearts with historic songs and courtly tunes of Gaelic Scotland and Ireland. Sung in their traditional Gaelic language, these songs are paired once again with the historic harp of the Scottish and Irish Celts: the wire strung Clarsach. Played for about 1000 years – from 800 to 1800 AD – this hauntingly beautiful instrument flourished in courts where Gaelic poetry was loved and revered; it was even heard in the American colonies, as an Irish harper was brought over by a Royal Governor of North Carolina! These early Celtic songs and harp strains have a powerful way of charming the ear – even St. Patrick himself warned his monks about them! Hear historic harp laments and Gaelic songs of love to move the heart, old Scottish Port tunes brought back to their original instrument, Pibroch – the great music of the Scottish and Irish pipes – played on the harp strings, and more. Come relish your ears and your souls with this rare opportunity to hear this haunting music brought back to life. Things Celtic seem to be appearing frequently in our culture – in music, art, jewelry, movies – as well as in spirituality. In fact, Celtic spiritual tradition is deeply embedded in our own Anglican Christianity. The ancient Celts prized deep connections with nature and the divine wisdom hidden within it – in the rocks, plants and animals that share our world, as well as in our souls and physical bodies. Due to current upheavals in our earth’s climate as well as in human society, a deep yearning for a different way seems to be emerging in many of us, which may find resonance in the wisdom of our Celtic Christian ancestors. In this introductory retreat, we will discuss what traits distinguish Celtic Christian spirituality, including images and ideas coming from earlier spiritual systems. We will read and discuss selected writings from early Celtic Christian theologians that illuminate their thoughts and theology. We will study and learn some prayers from the Carmina Gadelica, a collection of early Celtic prayers from the Hebrides, as well as some early Gaelic chants. We will hear and discuss stories of the Celtic saints. Through the beauty of prayer, chant, Celtic harp music and song, story, and time spent walking and praying in nature, we will seek to deepen our awareness of Christ's presence, within ourselves and in all that surrounds us. James Ruff is a professional singer and harper specializing in music for voice and harp from Gaelic Scotland and Ireland. A speaker of Scottish Gaelic and a member of the Episcopal Church since 2000, he has also been involved with the Ceile De (Culdee) Order – a Celtic Christian monastic order centered in Scotland – since 2005. He has sung as soloist with many early music groups, opera companies and festivals throughout the US and in Europe, teaches Music: Voice at Vassar College, and was Director of Music Christ the King Episcopal Church in Stone Ridge, NY from 2004-2015. The Society’s celebration of St. Andrew’s Nicht on November 30 begins with a gathering of members and guests at our building followed by a parade to the Fort Orange Club led by the pipes. After dinner, harper and singer James Ruff will provide musical entertainment: Gaelic bardic song and ancient Scottish harp music! A multi-media evening dedicated to the art of WWI with art song, popular song used to rally the forces, poetry of the period, and projections of posters, art, and photographs. Faculty performances by Miriam Charney and Michael Pisani, piano, Drew Minter, narrator, Rachel Rosales and Susan Botti, sopranos, James Ruff, tenor, and guest artists Mario Diaz-Moresco, baritone. James Ruff will be performing the classic WW1 Gaelic song: An Eala Bhàn, with his own harp accompaniment. Gaelic music for harp and voice interspersed in a lovely Celtic worship service, followed by a Gaelic Concert. St. Andrew’s is home to the only ongoing Celtic worship experience in the greater Springfield area. We offer this service on at 5 p.m. on the second Saturday of each month (except July and August). The hour-long worship experience features prayers and music from the British Isles, including materials from the Iona and Northumbria communities. Regardless of whether the prayers and songs are ancient or contemporary, each one reflects a Celtic spirit and many times will incorporate images from the natural world. Although the service is in English, we sprinkle in some Gaelic phrases and chants from time to time. The worship space is serene as participants are enveloped by candlelight. Holy Communion is celebrated and all are welcome to receive the gifts from God’s Table. Gaelic Concert of music for voice, harp and more with Irish artists Noeleen Ní Cholla & Tim Flaherty! Traditional Gaelic Music for Voice, Harp and more with artists from Ireland: Noeleen Ní Cholla & Tim Flaherty! Of Love and Lamentation: Gaelic music for harp and pipes expressing love and loss - with historical piper Ronan Browne! James Ruff leads you with voice and harp on a journey through rare medieval inspirational repertoire evoking both the early saints of Ireland and Scotland, and the great Gaelic heroes: Fionn MacCumhaill, the mythical hunter-warrior of Irish Mythology, and his band of warriors, the Fianna. This program will include chants from the Irish Offices of Bridget and Patrick as recorded in the 15th century MS 78 - Trinity College Dublin, as well as rare chants to Columba from the 14th century Scottish Inchcolm Antiphoner – some of the few remaining examples of Celtic medieval chant - all accompanied by the melting sound of the Clarsach. He will treat you to traditional Scottish Gaelic lays recounting the fantastic exploits of the Fianna – Fionn MacCumhaill, Oisín, Oscar, Diarmaid, Coailte, Fraoch, as well as sea monsters, Vikings and more - colorful examples of the Gaelic legends once so popular throughout the Gaelic-speaking world. This is the first fully staged production of the Old French Play of Adam in a lively new English translation. Adam—the oldest medieval drama in any language—begins in the Garden of Eden and ends with the expectation of Christmas, comically and poignantly updating the story of humanity's fall and redemption for a secular urban audience. A holiday play for all ages, the work is beautifully framed by the festive floral decorations of the season and accompanied by medieval music (Drew Minter, Peter Walker and James Ruff). The Irish Cultural Center Hudson Valley is honored to welcome Irish musician Liam Ó Maonlaí back to Kingston on Friday, November 4th. Liam has been the charismatic front man for the internationally known band, The Hothouse Flowers, since their beginnings in the late 1980's. He has honed his craft for decades and has earned his place as one of the most beloved and respected music carriers in Ireland. In addition to his two solo albums, Rian and To Be Touched, Liam's recent projects include showcasing the songs of Van Morrison, Leonard Cohen, and David Bowie in Irish Gaelic, touring the world as musical director for the dance performance, Rian, playing vibrant live shows with The Flowers, and collaborating with jazz singer Cassandra Wilson later this November at the Irish Center in Manhattan. Liam is an unforgettable performer who conveys sheer mastery in authentic Gaelic styles, original ballads, and blues-inspired rock and roll. He is a gifted singer-songwriter and multi-instrumentalist who delivers the ethos of Ireland and the universality of the human soul. Ulster County AOH celtic piper Scott Benson will perform the ceremonial opening, and a number of local musicians will join Liam throughout the evening. The evening’s performance will then begin at 7:30pm with music from Hudson Valley based Celtic group, the T McCann Band. The T McCann Band is an eclectic group of gentlemen musicians. They are known for their lively stage shows and their song & tune catalog reflects a fresh take on traditional Celtic music. Throughout the evening, there will also be supporting performances by dancers from The D'amby Project, based in Red Hook, NY. Founded in 2012, The D'amby Project offers dance classes beginning with traditional Irish training, advancing to contemporary. The Great Room upstairs at the Arts Society of Kingston offers the perfect listening space to experience Liam and local guest performers. Expect a moving evening! Before AND after the concert, we are excited to announce that dinner and drink specials will be available at Dermot Mahoney's Irish Pub, which is a few doors from the concert venue. In addition, during the intermission there will be a 50/50 and a raffle of wonderfu...l items from local businesses who are helping to sponsor the performance. The annual Hooley On The Hudson, Sunday September 4th of Labor Day weekend. A family friendly day-long event filled with music, dance food and crafts, celebrating the Irish! Three separate stages with performances are located along the historic, scenic Rondout Waterfront in Kingston. Stroll through the festival and enjoy the craft, food and beverage vendors, and beautiful waterfront. Presented by members of the music department faculty: Gail Archer, organ, Brian Mann, piano, Moran Katz, clarinet, Sophie Shao, cello, Anna Polonsky, piano, and James Ruff, tenor and wire harp. This is a rare opportunity for the community and music enthusiasts of any genre to experience this ancient art form of Gaelic music and singing (and possibly a song or two in English), along with traditional dance – a joyous, uplifting and enlightening event for all to enjoy. Currently in it’s 7th operating year, the Phoenicia International Festival of the Voice, considered a destination festival (“Opera News” – Metropolitan Opera), has an attendance average of 5000+ over the four days of the festival, with this year’s production hoping to be the largest yet. An evening concert with special performances featuring by known traditional music artists from Ireland and Scotland. This is a rare opportunity for the community and music enthusiasts of any genre to experience this ancient art form of Gaelic music and singing (and possibly a song or two in English), along with traditional dance. Performers include, An Crann Óg (group of eight young musicians from Ireland), Noeleen Ní Cholla (vocalist from Ireland), Joy Dunlop (vocalist from Scotland), Doimnic Mac Giolla Bhríde (Champion Traditional Gaelic vocalist from Ireland) and James Ruff (Tenor harpist and vocalist from the US). Performers include, An Crann Óg (group of eight young musicians from Ireland), Noeleen Ní Cholla (vocalist from Ireland), Joy Dunlop (vocalist from Scotland), and James Ruff (Tenor harpist and vocalist from Scotland). Things Celtic seem to be appearing frequently in our culture – in music, art, jewelry, movies – as well as in spirituality. In fact, Celtic spiritual tradition is deeply embedded in our own Anglican Christianity. The ancient Celts prized deep connections with nature and the divine wisdom hidden within it – in the rocks, plants and animals that share our world, as well as in our souls and physical bodies. Due to current upheavals in our earth’s climate as well as in human society, a deep yearning for a different way seems to be emerging in many of us, which may find resonance in the wisdom of our Celtic Christian ancestors. In this retreat, we will look at the writings of early Celtic Christian theologians as well as excerpts from the Carmina Gadelica, a collection of early Celtic prayers from the Hebrides. Through prayer, chant, Celtic harp music, Celtic song, story, and time spent walking and praying in nature, we will seek to deepen our awareness of Christ’s presence, within ourselves and in all that surrounds us. James Ruff is a professional singer and harper specializing in music for voice and harp from Gaelic Scotland and Ireland. A speaker of Scottish Gaelic and a member of the Episcopal Church since 2000, he has also been involved with the Ceile De (Culdee) Order – a Celtic Christian monastic order centered in Scotland – for ten years. He has sung as soloist with many early music groups, opera companies and festivals throughout the US and in Europe, teaches Music: Voice at Vassar College, and has been Director of Music since 2004 at Christ the King Episcopal Church in Stone Ridge, NY. James Ruff plays DANIEL in a fully-staged 12th-century music drama, presented by Gotham Early Music Scene (GEMS). Mary Anne Ballard, Music Director, and Drew Minter, Stage Director. A staple on Danbury’s holiday season, this performance of Handel’s Messiah will combine the forces of the Danbury Concert Chorus and Danbury Symphony Orchestra to be conducted by our Music Director and Conductor, Christine Howlett. James Ruff will be tenor soloist this year. For information and reservation, please contact via bobdomhnallach@msn.com. You will then receive an invitation to RSVP - seating is limited, so do not delay! The street address of the house concert will be sent to those who successfully RSVP. Performance will begin by 7:30 pm (standard) 2 sets with break that may include the opportunity to perform with the musician. Enjoy the intimate setting of Creative Co-op's space and learn more about each musician, their inspiration, and projects! Claire Nic Ruairi is an Irish traditional singer from Derry, Ireland. She is the singer in residence at 'an tSeanbheairic', Falcarragh, Donegal, having been awarded the prestigious Eamonn Ghrainne Scholarship. In 2013 Claire won First Prize in Irish language traditional singing at Fleadh Choeoil na hEireann, the largest traditional Irish music festival in existence which is held annually in various locations throughout Ireland. In addition to performing in and organizing traditional music events, Claire is a member of several traditional Irish language choirs. An Irish and French teacher, she is currently on a career break from a full-time post to concentrate on her singing. She is currently touring the area and performing at a number of local venues. Experienced in early music, concert and opera, tenor James Ruff has, since 2005 worked to master Scottish Gaelic language, traditional Gaelic Song, and the early Gaelic wire harp. He presents concerts highlighting the haunting beauty of the historic Gaelic music and poetry of Scotland and Ireland, playing the historic music of the harper bards. Music Director of Christ the King Episcopal Church in Stone Ridge, Mr. Ruff will perform with Claire Nic Ruairi for this special occasion. Bob McDonald, Gaelic Irish language teacher and event promoter, thanked everyone for making the event a reality. "It will be a wonderful opportunity for us to provide a window for the audience through which they can experience a rarely presented cultural jewel of Gaeldom, songs and melodies of great antiquity and beauty. It will be readily apparent that one does not have to speak Gaelic to appreciate the breadth and depth of human emotion and spirit contained within the songs and music." Irish traditional singer, Claire Nic Ruairí, has won the traditional Gaelic singing competition at the largest traditional Irish music festival in existence, the Fleadh Cheoil na hÉireann which is held annually at various locations throughout Ireland. You may hear Claire singing the beautiful Irish Gaelic song "Líontar dúinn an Crúiscín" at the beginning of this link: http://www.highlandradio.com/2015/07/09/ruaille-buaille-catchup-070715/. Experienced in early music, concert and opera, tenor James Ruff has since 2005 worked to master Scottish Gaelic language, traditional Gaelic Song, and the early Gaelic wire harp. He specializes in the "Classical music of the Gaelic world," searching the continuing stream of Gaelic traditional music for gems of the early bards and harpers. He presents concerts highlighting the haunting beauty of the historic Gaelic music and poetry of Scotland and Ireland, playing the historic music of the harper bards, rendering the great pipe music on the harp, and accompanying himself singing the great Gaelic songs. For more information and recordings, visit his website at: www.jamesrufftenorharper.com. Discount of $5 for students, seniors, and holders of BEMF pass. Use code BEMF at checkout. Pipe marches to stir the soul, noble laments that bring a tear to the eye, love songs to warm the heart, and stormy politics of 17th and 18th century Scotland and Ireland – James Ruff lends his voice to rare early Celtic music of the Gaelic world, sung in Scottish Gaelic and Irish, and accompanying himself on the wire-strung Clàrsach, whose bell-like tones rang through the great halls of the Gaelic clan chieftans. Music of the great harpers: O’Carolan, the Connellans’, Ruaraidh Dall, Denis Hempson, Hugh Higgins, and drawn from the Bunting, Neal, Forde and Straloch manuscripts. Concert to be repeated at Boston Early Music Festival Fringe on June 11th. A fully-staged 12th-century music drama, presented by Gotham Early Music Scene (GEMS). Mary Anne Ballard, Music Director, and Drew Minter, Stage Director. James Ruff, tenor, and Miriam Charney, piano. A vocal recital featuring Gabriel Fauré’s sensuous song cycle to the poetry of Paul Verlaine: “La Bonne Chanson.” Selected songs by other early 20th-century composers such as Albert Roussel, Pierre Capdevielle, Reynaldo Hahn and Francis Poulenc further enhance the afternoon’s exploration of the French poetic and harmonic genius. Love and loss through the eyes of the great clan poets: Sìleas na Ceapaich, Mary MacLeod and more. Sung in Scottish Gaelic and Irish, these rarely heard elegies and love songs naturally blend with the melting sound of the early Gaelic wire-harp. Selected tunes of the great harper-bards (Ruaraidh Dall, Thomas Connellan, Turlough O’Carolan) evoke the haunting poeticism of the Gaelic world.